Overview - WWII From Space delivers World War II in a way you've never experienced it before. This History special uses an all-seeing CGI eye that offers a satellite view of the conflict, allowing you to experience it in a way that places key events and tipping points in a global perspective. By re-creating groundbreaking moments that could never have been captured on camera and by illustrating the importance of simultaneity and the hidden effects of crucial incidents, History presents the war's monumental moments in never-before-seen context. And with new information brought to the forefront, you'll better understand how a nation ranked 19th in the world's militaries in 1939 emerged six years later as the planet's only atomic superpower. Over the years, The History Channel has covered WWII in exhausting detail, tracing the battles and strategies of the global conflict from just about every conceivable vantage point. That is, every conceivable vantage point except for one: Space! Sure, you've heard stories about the Battle of Britain, but have you ever seen it from space? You've witnessed the D-Day invasion reenacted countless times before, but have you ever seen it from space? You've read about the attack on Pearl Harbor, but have you ever seen it from space? Well, fear not, 'WWII from Space' finally let's you do just that, and the results are… underwhelming. Rather than the mind blowing new perspective that the History Channel's marketing department would have you believe, this is really nothing more than your standard WWII doc dressed up in a flashy gimmick that adds absolutely nothing to the proceedings. You see, it turns out that there actually is a reason we haven't seen WWII from space before: it's a really stupid idea. Through a mixture of narration, talking head interviews, CG reenactments, maps, archive photos, and "space" views, the documentary recounts many of the major battles and events throughout the war, including Pearl Harbor, The Battle of Midway, The Battle of Britain, the Battle of Stalingrad, and the D-Day invasion of Normandy. Details about the atomic bombings of Hiroshima and Nagasaki are also addressed, and several bits of tangential trivia are peppered throughout as well (including a brief segment about Hollywood's "Stars over America" campaign). While the focus shifts from conflict to conflict, the overall narrative traces how America eventually rose to become the world's greatest super power at the end of the war. Concise but comprehensive, the exhaustive material covers a lot of ground, but the limited runtime means that several battles and key events do get glossed over or completely skipped. Still, for a 90 minute rundown of the war, it hits all the major beats fairly well. The interviewees include military personnel, professors, and veterans, and all of the participants provide a steady stream of information that helps to tie together the onslaught of flashy visuals. With that said, a lot of their remarks are on the shallow side, and there is an overabundance of commentators repeatedly saying how so-and-so battle was arguably the most pivotal event in the war… for almost every battle talked about. I get that every loss and victory is integral, but they can't all be the turning point. The discussion primarily focuses on the combat strategies of the various battles highlighted, and the documentary is filled with animated diagrams and schematics that further detail the wartime maneuverings, vehicles, and weapons. Though well produced and visually interesting, a lot of these graphics become rather redundant and superfluous. More effective, are the snippets of CG battle scenes, but these sequences are far too brief to offer much value or excitement. As a whole, the entire runtime suffers from a superficial presentation that never really offers enough substance beneath all of its excess flash. The information itself has merit, but the dry facts are all dressed up by empty style that rarely enhances the material being discussed. This is perhaps no better revealed than in the documentary's overarching "space" gimmick. I'm not exactly sure what I was expecting, but it turns that all the 'From Space' in 'WWII from Space' really means, is that we're treated to a couple of fake satellite views of the world filled with digital markers representing the various combatants. In other words, we get another damn map of the battlefield, only this time the locations are even smaller, and there's a bunch of annoying clouds in the way obstructing the image. A narrator will chime in every time we cut to one of these "space" views spouting out some kind of hyperbolic statement about how much more is revealed from this new groundbreaking vantage point, but after a while I started to question who he was trying to convince with all his grandiose observations: the viewers or himself? While the pulled back perspective does show a larger picture of the overall conflict, allowing us to see multiple countries mounting strategies at once, a simple aerial view of the Earth with a bunch of dots and arrows on it isn't exactly very engaging or enlightening. Even more perplexing is how rare these mock satellite views actually are, further exposing the entire gimmick as the utterly bizarre, forced-in marketing nonsense that it is. With its never ending assortment of WWII related programming, it was only a matter of time before the History Channel reached a point where there was nothing new left to explore. 'WWII from Space' is that point. The historical information is decent, but they're the same facts that have been repeated countless times in similar programs, merely regurgitated here yet again. Even worse, the documentary's one defining characteristic is really nothing more than an incredibly silly gimmick. Big history buffs may want to check this out for its concise overview of the war, but those actually expecting a new, worthwhile perspective on the conflict (or aliens) will be greatly disappointed. 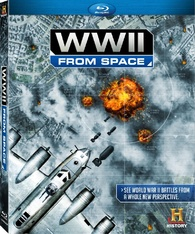 Lionsgate brings 'WWII from Space' to Blu-ray on a BD-25 disc housed in a keepcase with a cardboard slipcover. Some skippable trailers play upon start up before transitioning to a standard menu. The release is region A coded. The movie is provided with a 1080p/AVC MPEG-4 transfer in the 1.78:1 aspect ratio. Filled with elaborate graphics and CG reenactments, the documentary looks pretty slick, and the transfer holds up well from a technical perspective. The digital source is mostly clean, but some artificial grain has been added to a lot of the battlefield footage and schematics to help give the picture a grittier look. Minor banding and false contouring are visible in some of the CG shots, but the image is free from any egregious artifacts like noise or aliasing. The talking head interview scenes feature a pleasing, professional look, and while colors are slightly undersaturated, the chosen palette still demonstrates rich texture and sharp clarity. The computer generated battle scenes, maps, diagrams, and "space" views all feature crisp imagery and solid detail. Contrast and black levels are steady and balanced throughout. With its mixture of standard interviews and flashy graphics, 'WWII from Space' comes away with a solid visual presentation. Some negligible banding is visible, but the transfer is technically sound otherwise. The program is presented with an English DTS-HD Master Audio 5.1 track, along with optional English SDH and Spanish subtitles. The interview segments are basic, but the reenactment scenes offer some occasional kick, lending some decent variety to the mix. Narration and speech are clear, full, and well balanced throughout, giving each historical fact and grandiose statement ample weight. The dramatic music score features nice separation throughout the soundstage and carries a strong sense of fidelity and dynamic range. Various mechanized sounds and effects sync in tandem with the numerous computerized charts and schematics on screen, but the design work is fairly one-note and superficial. With that said, the CG battle sequences do offer an appropriate assortment of explosions, artillery fire, and swooping fighter planes, spreading smooth directional imaging around the room. While there is some decent low frequency activity, bass is comparatively subdued and all of the battle effects are slightly muted so as not to overpower the information being shared by the narrator and various participants. 'WWII from Space' offers a bit more punch than your standard documentary, but the war reenactment sequences never come close to Hollywood efforts. Trailers (HD) - Trailers for 'The Men Who Built America,' 'The Hurt Locker,' and 'Apocalypse Now' are included. 'WWII from Space' is what happens when a network runs out of ideas. After covering the war from so many different perspectives, the History Channel has moved on to the final frontier, and sadly the results are extremely underwhelming. The "space" aspect is a useless gimmick and while there is some decent historical information offered, it's muddled by empty style and needless flash. The video and audio are both solid but there are no real special features included. Huge history buffs might want to give this a look, but there are far better programs about the war available.